This card sold for $300 in November 2017. 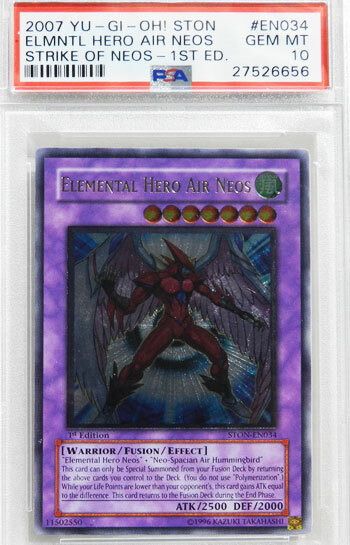 This in an Ultimate Rare from the Strike of Neos set, which was released in 2007. Ultimate rares have foil on the artwork, artwork borders, the attribute icon, and the level stars. The card name is also printed gold. An ungraded copy of this card sold for $64. A score of Gem Mint 10 can add so much value to a card’s sale price! Some quick notes on our rankings: These are all cards you could have reasonably collected in the United States. These are cards that appeared in booster packs, video games, leagues, and/or Starter Sets. Yugioh TCG fans/players could have plausibly obtained these cards through auctions, trades and/or blind luck pulls. There are no “prize cards” or “error cards” on our list. All values are based on actual sales of YGO Cards on eBay during the 3rd/4th quarter of 2017. Our Prices are mostly based on Professionally-Graded, Gem Mint cards, which are independently certified on their condition. Here’s an article on Graded Pokemon Cards if you don’t know what Graded Cards are.